In the previous article (http://ponnadi.blogspot.in/2012/12/charamopaya-nirnayam-ramanujar-avathAra-rahasyam.html) we have seen emperumAnAr's avathAra rahasyam revealed by many. Now, we will continue on with the next section where many great personalities reveal emperumAnAr's greatness. In vaikuntam which is the paramapadham, emperumAn is with srI, bhUmi, nILA dhEvis and being constantly served by bhakthas and bhAgavathas. AzhwAn further says that, dhEva perumAL granted him his desire, but said "since I am vAniLavarasu (prince in paramapadham who just enjoys and has given all the control of paramapadham to vishwaksEnar, etc) my svAthanthriyam is limited; You go and ask udayavar who is leader amongst nithyasUris and he allows you to leave from here and go to paramapadham, you shall do so". AzhwAn then requests udayavar to allow him to accept emperumAn's order. udayavar, knowing the Arthi (extreme desire) in AzhwAn's heart, recites dhvaya mahAmanthram in his right ear and tells him "Nalam aNtham illathOr NAdu puguvIr" (நலம் அந்தம் இல்லதோர் நாடு புகுவீர்) meaning "you shall enter the paramapadham which has unlimited auspicious qualities". AzhwAn then requests udayavar to allow the same for nAlUrAn (one of his own sishyas who caused AzhwAn to lose his eyes) to get paramapadham (as well) and udayavar replies "Just like when kaNNan emperumAn accepted gaNtA karNan, his brother also got the same result, when I accepted you, automatically nAlUrAn also becomes accepted". Only after this AzhwAn left to paramapadham. Thus dhEva perumAL and udayavar himself demonstrated udayavar's greatness. dhEva perumAL also revealed here that emperumAnAr is none other than Adhi sEshan himself. Subsequently, udayavar instructs parAsara bhattar to perform thiruvadhyayanam for AzhwAn and after the completion, he brings bhattar to periya perumAL for mangaLAsAsanam. At that time periya perumAL tells bhattar "Dont feel sad that you have lost your father; I am your father now" and accepts bhattar as his own son. He further says "Dont worry about everything. While in this world, I will ensure that you are well taken care off; For the ultimate goal of attaining paramapadham, when my dear rAmAnujan is here you dont have to worry about that as well. Simply think that udayavar is your protector and stay happy". Thus periya perumAL himself revealed udayavar's greatness. udayavar along with his sishyas during a dhivyadhEsa yAthrai arrived at AzhwAr thirunagari. 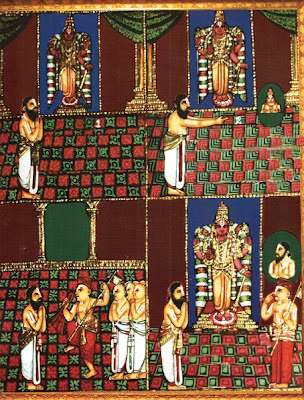 There, udayavar recites kaNNinuN chiruthAmbu in front of AzhwAr and AzhwAr being very pleased speaks through his archakar and gives aruLappAdu (invitation) to udayavar. He instructs udayavar to place udayavar's head directly under AzhwAr's lotus feet and udayavar ecstatically obliges. AzhwAr then invites all the srivaishnavas and kOil kainkaryaparas and informs them "Whoever wants my sambandham (relationship) should surrender to my dear rAmAnujan who represents my lotus feet. If you surrender unto him, I will consider that that you have surrendered unto me. By surrendering to udayavar, you can relieved from this samsAram". 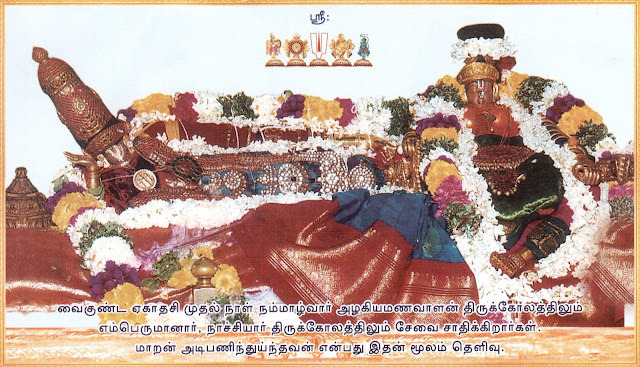 From that day onwards AzhwAr's thiruvadis are famously called "srI rAmAnujam". Until then, AzhwAr's thiruvadis used to be called "madhurakavigaL". Keeping this in mind, thiruvarangathu amudhanAr said "mARan adi panNiNthu uyNthavan" (மாறன் அடி பணிந்து உய்ந்தவன்) in rAmAnusa nURRanthAdhi meaning emperumAnAr is the one who grew in stature after surrendering to nammAzhwAr. madhurakavi AzhwAr, being sarvagyar, knowing AzhwAr's thiruvuLLam, sung "mEvinEn avan ponnadi" (மேவினேன் அவன் பொன்னடி) in kaNNinuN chiruthAmbu meaning I surrendered to his (AzhwAr's) golden feet. Instead of saying lotus feet (which is the normal practice), he said golden feet, since gold is considered as the best amongst all objects, that is desired by everyone, one which can get anything we want, and one that is considered as the ultimate goal, one which stays with anyone (without discrimination), one that is liked by men and women alike, once had it will be preserved carefully and once lost people will even give up their lives due to its values. We can see all of the above qualities in udayavar also. When udayavar ascended to paramapadham, many followed (gave up their lives also). kaNiyanUr siriyAchAn left udayavar to live in kaNiyanUr for some time and some time later he started his journey towards kOil to worship his AchAryan (udayavar) with much love. On the way, he meets a srivaishnava and he asks "Is our AchAryan emperumAnAr living healthy?" and that srivaishnava explains about udayavar's journey to paramapadham. Hearing this, immediately, kaNiyanUr siriyAchAn said "emperumAnAr thiruvadigaLE charanNam" (எம்பெருமானார் திருவடிகளே சரணம்) and ascended to paramapadham. kumANdUr iLayavilli (who is the maternal cousin of emperumAnAr like embAr) was living in thiruppErUr. One night, in his dream, he sees udayavar seated on a brightly glowing divine chariot and in the sky, he sees, paramapadhanAthan with thousands of nithya sUris, AzhwAr, nAthamunigaL and other AchAryas, with many persons playing divine musical instruments to receive emperumAnAr and bring him to paramapadham. He sees that, after the reception, emperumAr's chariot is leading the journey towards paramapadham with everyone else following him. He then wakes up and realizes what has happened. He immediately informs his neighbour "vaLLal maNivaNNan" that "Our AchAryan emperumAnAr has climbed a divine chariot and left to parampadham with paramapadhanAthan and nithyasUris. I cannot live anymore here. emperumAnAr thiruvadigaLE charaNam" and gave up his life and immediately ascended to paramapadham. There were many such sishyas who gave up their lives immediately after hearing about emperumAnAr's journey to paramapadham. Those who stayed with emperumAnAr were strictly ordered by emperumAnAr to not give up their lives and since emperumAn desired for those srivaishnavas to continue their lives to serve for the sampradhAyam they unwillingly continued their lives. Thus emperumAnAr's greatness is such that in his separation his sishyas would also give up their lives. In the next section, we will see the uththArakathvam of udayavar as revealed by many great personalities.